The Jumping Frog Jubilee takes place May 13-16, 2010. 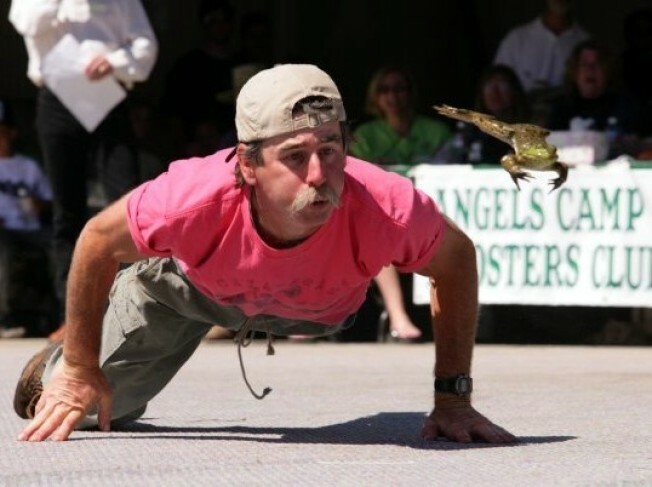 The Jumping Frog Jubilee: Does the annual Jumping Frog Jubilee, which takes place in Calaveras County, have anything to do with Mark Twain's celebrated short "The Celebrated Jumping Frog of Calaveras County"? One guess. Calaveras County: A rolling slice of Gold Rush prettiness set snug against the slopes of the western Sierra. The competition: You have a frog. You need that frog to do what it does so well: jump far. If he or she does so, you win. About 2,000 frogs participate; only 50 make it to the finals. One awesome amphibian by the name of Rosie the Riveter once leapt over 21 feet. Frog-adjacent doings: There will be a cute county fair. And plenty of sightseeing, both around historic Angels Camp and the nearby gold towns, is prime. We recommend a stop in Murphys, which has wine-tasting room after wine-tasting room along its quaint main drag. Stays: There are many inns along Highway 49. Many. Do you want something with a flowery-tea vibe, or something with an austere Old West look, or something a tad ghosty? Bet you'll find it around Angels Camp or the surrounding area. We're fond of both the Imperial Hotel in Amador City and The Foxes Inn in Sutter Creek, both about an hour-ish north of the froggy haps.